LOUISVILLE — Ecumenical collaboration is the core of my service as a Presbyterian Church (U.S.A.) mission co-worker. That collaboration includes partnering with Churches Witnessing with Migrants (CWWM), a grassroots network of migrants, migrant-serving groups and faith-based institutions. Through ecumenical collaboration, CWWM’s mission is to claim the God-given dignity of migrants in a framework of human rights, sustainability and development justice. The faith-based institution that I know best is the United Church of Christ in the Philippines (UCCP), the denomination that has invited me to work with their national office. The UCCP is an organic union of five historic mission churches: the Presbyterian Church (U.S.A.), Church of the Brethren, Congregationalist, Disciples of Christ and Philippine Methodist. A 70-year-old denomination, the UCCP sponsors Migrant Ministry programs that provide pastoral support to families of migrant workers, as well as assistance for migrant workers in asserting their human rights. Partners such as the United Church of Christ (Congregationalists) and Disciples of Christ support CWWM as an international platform and a Philippine national network. This financial support strengthens this platform and emphasizes advocacy and other action on global migration, especially forced migration. This past year, the Philippine national network hosted two consultations for the purposes of building effective regional networks that will serve migrant workers. At our initial meeting in March, our main goals were getting to know one another and reviewing the pending United Nations Global Compact for Safe, Orderly and Regular Migration. During a meeting in mid-October, we learned about each region’s plans and developed shared plans. 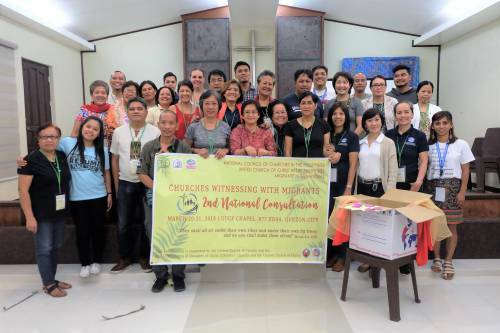 Ecumenical collaboration flourished with attendees from member churches of the National Council of Churches in the Philippines (NCCP). Other attendees represented Catholic organizations and the Moro (Muslim) community. In December, I joined my Filipino colleagues, and others from around the world, in Morocco to commemorate CWWM’s 10-year anniversary and the United Nations’ historic adoption of the Global Compact for Safe, Orderly and Regular Migration, the first intergovernmentally negotiated agreement to cover all dimensions of international migration in a holistic and comprehensive manner. We look forward to mutual ministry and mission in solidarity through implementation of the U.N. Global Compact. The Rev. Cathy Chang is World Mission’s regional facilitator for addressing migration and human trafficking. She and her husband, Juan Lopez, are based in the Philippines.